For all intents and purposes, you can forget about that El Niño now. It was the largest El Niño ever recorded. But what was thought to be a “Godzilla” weather phenomenon actually turned out to be pretty much a dud in many ways for California, according to Bill Patzert, a climatologist at the NASA Jet Propulsion Laboratory in Pasadena. Instead of a monster it was a gecko, Patzert said. And instead of the drought-busting rains everyone had hoped for, California residents in the southern part of the state saw lots of rare sea creatures wash up on beaches, while Central Coast residents got a healthy dose of hail at times. Go away El Niño; you’re drunk. There was so much warm water in the ocean, as Patzert describes, that it generated a high-pressure system and drove storms to the north. The only real good news from this year’s El Niño, according to Patzert, is the record level of snowpack in the Sierra Nevadas. However, El Niño is still active and there’s a small possibility that California could experience what Patzert calls a “second bounce.” But don’t hold your breath. For the most part, Patzert admits his prediction for rain along the Central Coast was wrong. Yet, his original premise stands true: El Niño wasn’t going to quench our thirst. Now we’re entering the fifth year of the drought and the next global weather phenomenon, La Niña, which Patzert expects to bring us a long, hot summer. Get used to your new waterless lifestyle, he said. It’s a hard reality to accept. But when life gives you lemons, make lemonade. In this case, when life gives you drought, you make rocks for drought-tolerant landscaping. The struggle for water is about to get real for some businesses, but not so much for others. For this story, the Sun profiled a few local entrepreneurs who are learning how to make money without water. Few things are more satisfying than getting your car washed. That feeling when you soap up your ride followed by a thorough, unadulterated drenching wash-down with a garden hose. Of course, water was more plentiful back then than it is now. Jennifer Arcitio’s Clean and Green Auto Care is a mobile car wash service and uses virtually no water. But with the continuing drought, the conventional car wash may soon be a thing of the past. Enter the waterless car wash. Seriously? Yes. There is a way to wash your ride with practically no water. Growing up in Arroyo Grande, Jennifer Arcitio loved washing cars as a hobby. But her hobby eventually segued into a profession, and it took something as big as a drought to give Arcitio the push to start Clean and Green Auto Care, her first venture as a businesswoman. 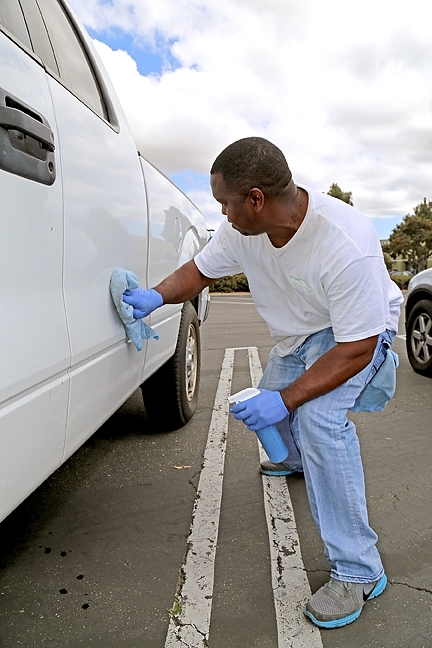 On a recent Tuesday, Arcitio demonstrated how a waterless car wash works in a parking lot in the Madonna Shopping Center in San Luis Obispo. Spray on, wipe off. No water. No fuss. “We don’t bring a hose to what we’re doing,” Arcitio said. Arcitio got the idea from her daughter, who noticed other mobile car wash companies utilizing the waterless method in Southern California, where she was attending school. Arcitio didn’t know what to think of the practice at first, but she learned more and became amazed. “The first thought is how are you going to do something without water that you normally do with water without scratching the paint?” Arcitio asked. More questions remained: Is it going to be time consuming? And, what’s the effort going to be like? What will the finish look like? It comes down to what’s in the solution. After some research, Arcitio was drawn to the eco-friendly concept of using biodegradable, natural polymer-based substances. The solution is made from plants such as palms, coconuts, and soybeans, and contains little water. Using less than a cup of water, Arcitio sprays a fine mist of a solution from a bottle onto the car and wipes it off with a microfiber cloth. It’s all manual labor. The way the solution works, she said, is similar to Teflon. 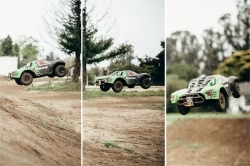 Just like how food doesn’t (or at least it isn’t supposed to) stick to Teflon-coated pans, dirt shouldn’t stick to the car. Anything other than microfiber will smear the solution, which also protects the car from ultraviolet rays. There’s at least one caveat to this method: It can be time consuming depending on the size of the car. For a small car like a Honda Civic, Arcitio said it takes as little as 15 to 20 minutes to spray and wipe the exterior. Larger vehicles, like trucks, obviously take longer. That’s why she charges more. Packages start at $14.99; deluxe packages for trucks and SUVs are $40.99. Arcitio started her company on April 1 and began with only one call per week. Two months later, she’s getting up to six calls per day—many of them repeat customers. She’s even getting requests for fleet accounts. It’s a mobile company, but for now, Arcitio serves customers only in the SLO and the Five Cities region. In time, she hopes to expand to Santa Maria and beyond. She’ll be camped out in the parking lot at Kmart located at 1570 W. Branch St. in Arroyo Grande every Saturday and Sunday from 8 a.m. to 7 p.m.
Arcitio said she was drawn to this method for two reasons: to reduce water consumption as well as her carbon footprint. “I personally feel like I need to make a change, especially with the current drought situation we’re dealing with as Californians,” Arcitio said. Keeping a plush lawn is simply not a practical matter for homeowners in California anymore. Because of scarce water, jurisdictions have taken to restricting outdoor watering to only two days and heavy fines for wasting water. Lompoc gradually steps up fines for water wasters, charging $50 to $250 depending on how many times a person violates the restrictions. Many lawns simply go un-watered and the lawn turns to dirt. But before it does that, you can ostensibly put some life back into your dead grass before it withers away completely. For his company Lawnlift, Mike Morales uses a nontoxic, biodegradable green paint to use on lawns. He guarantees longevity of three months. Mike Morales started his company Lawnlift in May 2015 after viewing a TV documentary about flipping houses. He watched as a contractor sprayed a lawn with green paint. After doing a little research, Morales picked up some supplies—a backpack sprayer and green paint—and got to work. He won’t divulge exactly where he gets his paint, but Morales did say he buys it off the Internet. He said it’s an environmentally friendly paint that biodegrades over time. 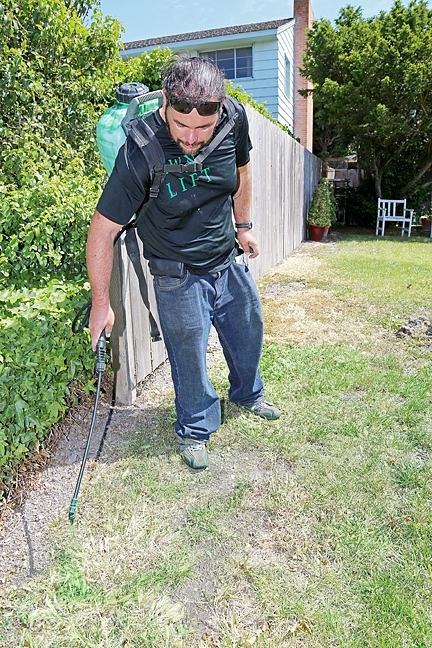 Morales began Lawnlift as an alternative method to converting lawns to drought-tolerant landscapes, such as with artificial turf or rocks—which can cost several thousands of dollars, he said. Some were skeptical of the idea, like Morales’ dad, whom Morales describes as “old school” when it comes to the landscaping profession. For his services, Morales charges anywhere between 15 cents and 25 cents per square foot, with the price varying depending on the type of grass and the size of the lawn. The fresh green paint awkwardly contrasts with the natural color of the grass, but turns more natural as it dries. He guarantees the longevity of the paint for at least three months. The average price for a lawn he paints ranges anywhere from $200 to $1,000. But that’s less expensive than other lawn painting services in California, which charge anywhere between 50 cents and 75 cents per square foot, according to Morales. Starting his business was fairly easy. He paid a small fee, filled out some paperwork, and got rolling. Since the Sun interviewed Morales in June 2015, business has steadily picked up. Things slowed down a bit with the rain brought in from El Niño, but now Morales is restarting sooner than he expected. Usually the season starts in June, he said. Morales also picked up a client in mid-May, the Wyndham Resort in Solvang, where he said he painted approximately 9,000 to 10,000 square feet of lawn. Doug Troesh got started in the landscaping business in his late 20s with Troesh Supply Company (TSC) in Nipomo, but sold his side of the company to his sister and brother-in-law, co-owner Elijah Coleman, and the company was renamed Troesh Coleman Pacific (TCP). Now he’s into artificial turf. Doug Troesh hopes to open Santa Maria’s first artificial turf warehouse in June. 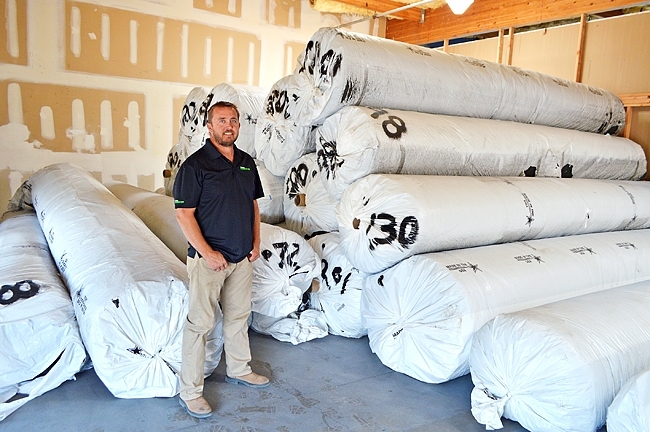 Located at 2250 Preisker Lane, suite C, Troesh is gearing up to open Central Coast Synthetic Turf, what he believes is the only artificial turf warehouse in North County. Dave Bozarth from Ozone Landscape owns the company, but Troesh is helping the new turf warehouse get up an running. The place is still going through construction and already Troesh is feeling a demand for his product. Calling Troesh’s headquarters a turf warehouse is potentially misleading. The place is relatively small, no bigger than 2,500 square feet, although it packs up to nearly 60,000 square feet of turf at any given time. It’s not a wholesaler. Whether you’re a contractor or a homeowner, Troesh said you’ll be able to walk away with turf the very same day. Contractors can purchase turf by the roll, and homeowners can slice off a custom-sized sheet. Walking up to the front door, you’d never know that he’s got artificial turf planted along the sidewalks unless you examined it closely. That’s because Troesh said the technology is getting better. Inside, several rolls of turf wrapped in plastic are stacked in one massive pile that nearly touches the ceiling. Other rolls sit on spools ready to be sold by the sheet. Troesh will have several varieties for sale. Some notable varieties are putting-green grass and Troesh has the exclusive right to sell a variety known as Kali grass, which he said is made with around 85 percent recycled material and manufactured in the good ole US of A. The interior of the new building still needs work. Inside, the walls are painted to resemble a blue, cloudy sky. Troesh wants to install a single indoor putting green in the entrance. If not fake grass for a lawn, then rocks will do just fine. Back at TCP, a giant machine crushes rocks. Located along the northern end of the Santa Maria River, TCP harvests rocks from two pits about 3 1/2 acres each. It’s a small operation compared to other quarries, according to co-owner Elijah Coleman. They mine for a rock called cobblestone, which TCP sells for landscaping purposes. Coleman said TCP mines about 50,000 yards per year. Using rocks is a less expensive alternative to turf, Coleman said. He said expect to pay $3 to $4 more per square foot for the turf. For TCP, Coleman said the drought is a good and a bad thing. When the rains come, the river fills with water and the flow helps produce the smooth stones that people want. However, ever-decreasing annual rainfalls make Coleman question the sustainability of the operation. At the rate of the drought, Coleman estimates there’s about two more years worth of rocks in the mines. Then there’s Roxsand, the other half of TCP, which mines sand and recycles asphalt materials to be reused for construction backfill. If the drought continues, Coleman said, then Roxsand will be affected and so will construction projects. Despite this possibility, Coleman remains optimistic. “Whether it’s drought or the economy, there’s always a way to survive,” Coleman said.